Young Charles Darwin first stepped onto the barren shores of the Galapagos Islands in September 1835. "Nothing could be less inviting," the 26-year-old amateur naturalist wrote in his diary. "A broken field of black basaltic lava is everywhere covered by a stunted brushwood which shows little signs of life. ... Although I diligently tried to collect as many plants as possible, I succeeded in getting only ten kinds; and such wretched looking little weeds would have better become an arctic than an equatorial Flora." Four years earlier, Darwin had boarded the HMS Beagle as a gentleman companion to its troubled young captain. Now, having finished their surveys of coastal South America, they had finally begun their two-year journey back to England. But hunger and some tantalizing tales of tasty tortoises drew them to the mysterious islands about 600 miles west of Ecuador. By the time their five-week exploration of the volcanic islands ended, Darwin's initial dismay had turned to delight. For the Galapagos teemed with strange, unexpected life. "I met two large tortoises, each of which must have weighed at least 200 lbs," wrote Darwin in his journal. "These huge reptiles, surrounded by black lava, the leafless shrubs, and the large cacti, appeared to my fancy like some ante-diluvian animals." "I frequently got on their backs... but I found it very difficult to keep my balance." 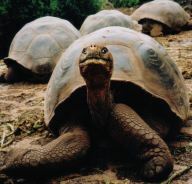 To Darwin and his curious shipmates, the Galapagos Archipelago seemed an unlikely home to tortoises, turtles and exotic birds. None seemed more out-of-place than its thriving colonies of penguins. These stately birds, smaller than their antarctic cousins, had migrated from colder lands and adapted to the arid climate. Their presence demonstrated the amazing resilience of life. But did they demonstrate evolution -- or merely the vast variability within the gene pool of their own species? Unlike the sea lions and iguanas, the ubiquitous little finches had learned to fear man. Natural selection may well have weeded out the trusting ones who dared to brave the capricious nature of man. While Darwin seemed unimpressed by the tame little birds, he dutifully gathered specimens from the various islands. Later, back in England, he donated his collection of bird skins to the Zoological Society of London. Its researchers treasured the gift. The respected ornithologist John Gould was especially thrilled with "a series of ground finches, so peculiar in form that he was induced to regard them as constituting an entirely new group containing 14 species, and appearing to be strictly confined to the Galapagos Islands." Fourteen separate species of finches? Could thirteen new species have "evolved" from two or more mainland finches that had survived the journey across the sea? Had they broken the "species barrier"? These questions captivated the minds and imagination of London's intellectual community. Many humanists had already embraced social evolution as a vision for human progress and a model for social change. Now they sought the evidence needed to substantiate their assumptions. They wanted scientific proof that would persuade humanity to move beyond the "outdated" views of the Bible and follow the alluring vision of an evolving universe. Could the finches meet that need and validate their theory? Yes, argued Dr. John Gould, Thomas Huxley and other respected authorities. The tiny birds, isolated from the mainline varieties, had surely broken the species barrier. Through natural selection and what they believed to be genetic inheritance of newly developed traits, thirteen new species had evolved from one. Or had they? Caught up in the excitement of these affirming assumptions, Darwin described his view of the "transmutation of species." He "had been greatly struck" by the "character of South American fossils and species in Galapagos Archipelago. These facts (especially the latter) became [the] "origin of all my views," he wrote in his 1837 journal. Darwin assumed that natural "selection was the keystone of man's success," but he wondered "how selection could be applied to organisms living in a state of nature." He found his answer when he read Malthus' Essay on the Principle of Population. "At once," it occurred to Darwin "that under these circumstances, favorable variations would tend to be preserved and unfavorable ones to be destroyed. The result of this would be the formation of new species." Relieved, he wrote, "Here, then, I had... a theory by which to work." Now he could begin to flesh out his "theory" with the right kind of evidence. Darwin would soon give the waiting world a plausible "explanation of how evolution occurred, free from miraculous intervention or unfounded fancy." Yet, his journal shows his doubts. While his theory seemed to make sense, he needed to show some transition stages that would validate this evolution process. But where were the missing links? "I lie under a heavy disadvantage, for out of the many striking cases which I have collected, I can give only one or two instances of transitional habits and structures in closely allied species of the same genus; and of diversified habits... in the same species. And it seems to me that nothing less than a long list of such cases is sufficient to lessen the difficulty in any particular case...." Emphasis added. That long list never appeared. And Darwin's imagined "instances" collapsed under closer scrutiny. He had been right about natural selection as a means to adaptation and variations. That part of his theory had already been accepted by both Christians and humanists alike. But he drifted into the realm of speculation and supposition when he used it to explain the origin of life and the appearance of new species. "are also a classic model of speciation: again, they figure in virtually all of the textbooks, very often as the central illustration. That is why these birds have become such a universal symbol of Darwinism process, so that their beaks now represent evolution the way Newton's apple represents gravity." The beak is the key. Is it large, medium or small? Is it the beak of a ground finch, tree finch, cactus finch or lava finch? Compare the beaks in the pictures below. The first two show a Large and a Medium Ground Finch. The first two pictures in the second row show a Small Lava Finch and a Cactus Finch with a beak better adapted to pecking into the cactus. The third picture shows a Yellow Warbler, not a finch. But its beak resembles that of the Warbler Finch. Jonathan Weiner and other evolutionists have viewed the finch population as a "classic model of speciation." But the question bears repeating: do adaptations and variations actually support the evolution of new species? Might John Gould, Darwin and his passionate promoter, Thomas Huxley, have been overly zealous in their attempt to provide a "scientific" basis for their social philosophy? "A Galapagos finch has about one hundred thousand genes," wrote Weiner, "roughly the same number as a human being. The genes are spelled out in a total of about one billion letters, an average of ten thousand letters to a gene." In other words, the huge gene pool of the generic finch, which was spelled out in the DNA, contains a vast assortment of options. Like humans, each little bird is unique. And just as brown-eyed parents can give birth to children with blue, brown or green eyes -- so finches, through history, have given birth to offspring with countless variations in their beaks. Statistically, these variations change from year to year. When seeds are plentiful, as during the heavy rains brought by the 1983 El Nino, all the variations thrive. In fact, that year the birds mated again and again, and their population skyrocketed. The next two years were dry. Baked by the hot, equatorial sun, the plants withered and seeds became scarce. With a finch population that far exceeded the food supply, many birds died. But something strange happened. During former droughts, the population of the Small Ground Finches had shrunk along with the supply of small, easy-to-eat seeds, while finches with large, strong beaks survived. But now the tables had turned. "Natural selection had swung around," wrote Jonathan Weiner. "Big birds with big beaks were dying. Small birds with small beaks were flourishing. Selection had flipped." And the hybrids -- the finches that found mates outside their own supposed species -- did best of all. "...the misfits are not dying out; they seem to be thriving," wrote Weiner. "Strange as it seems, these hybrids are the fittest finches on the island." "the major subdivision of a genus or subgenus, regarded as the basic category of biological classification, composed of related individuals that resemble one another, are able to breed among themselves, but are not able to breed with members of another species." Apparently, the word "species" has been stretched and redefined by those who need a more flexible and inclusive meaning. Could this be another example of adaptation -- a human modification needed for the protection of a mass-marketed philosophy? "...the rise and fall of the mixed breeds takes nothing away from the power of natural selection. On the contrary. It shows more vividly than ever before that Darwin's finches are new beings on this earth." Emphasis added. "They're undoubtedly species," said Rosemary Grant who, with her husband, led most of the research on the Galapagos finches. "They differ in song, size, and shape." So do dogs. From the small, short-nosed Pekinese to the tall, long-nosed Collie, they all belong to one species. The selective breeding of dogs brings results that parallel the emerging varieties of Galapagos finches. Intentional human selection, like natural selection can build up one variety and bring another to extinction. Adaptation in strains of bacteria illustrates this process well. With the introduction of antibiotics, the stronger "individuals" adapted to the changing conditions. While the less resistant variations died out, a small number of more resistant varieties survived, multiplied and thrived. Soon the new strain became dominant. Natural selection brought survival of the fittest -- but only within the particular gene pool. "Natural selection by itself is not evolution. It is only a mechanism that, according to Darwin, can lead to evolution." But Darwin was never able to validate his belief that selection could lead to evolution. "Even after half a century, Darwin's point about variations was still being defended with imaginary illustrations, and attacked for being imaginary. Darwin himself never tried to produce experimental confirmation of this particular point. It is at once extremely logical and extremely hard work to prove. Certainly he could not prove his case with his finches." Emphasis added. Nor would he or his disciples "prove his case" with other illustrations. Year after year, new explanations have replaced obsolete answers to the origin of life and species. And many of today's most popular answers have survived only because the door has been shut to those who bring contrary facts that challenge politically correct suppositions. Genuine science means seeing and measuring what really happens, then reproducing the same changes. Darwin and his followers neither saw nor measured the earth's early changes and the origin of life. In spite of the billions of tax dollars spent in search of credible answers to questions that challenge the theory of evolution, they cannot reproduce those envisioned processes nor verify their tenuous conclusions. And even when their explanations prove to be faulty or falsified, leading evolutionists refuse to admit the wrong -- that is, until they have found a new hypothesis to fill the gap. "It cannot be stressed enough that what natural selection actually does is get rid of information. It is not capable of creating anything new, by definition." "The price paid for adaptation, or specialization, is always the permanent loss of some of the information in that group of organisms." "Natural selection, by itself, is powerless to create. It is a process of 'culling,' of choosing between several things which must first be in existence." "Perhaps if evolution's 'true believers' really had convincing evidence of a creative process, they would not feel obliged to muddy the waters so often by presenting this 'downhill' process (natural selection) as if it demonstrated their belief in the ultimate 'uphill' climb--molecules-to-man evolution." Emphasis added. In other words, natural selection can only select options from the pool of information already available. Only God could create this world from nothing and design its amazing creatures -- each with its own set of instructions or DNA. He alone has watched our beginnings and measured our changes through the millennia. Who determined its measurements? Surely you know!" "Does the hawk fly by your wisdom, and spread its wings toward the south? Does the eagle mount up at your command, and make its nest on high? On the rocks it dwells and resides, on the crag of the rock and the stronghold. From there it spies out the prey...."
"Shall the one who contends with the Almighty correct Him? "Have you an arm like God? Or can you thunder with a voice like His? Look on everyone who is proud, and humble him." 'I know that You can do everything, and that no purpose of Yours can be withheld from You. Things too wonderful for me, which I did not know.'" Darwin's Black Box: "During the fall of 1996, a series of cultural earthquakes shook the secular world with the publication of a revolutionary new book, Michael Behe's Darwin's Black Box.... The reviewer in the New York Times Book Review praised Behe's deft analogies and delightfully whimsical style, and took sober note of the book's radical challenge to Darwinism. Newspapers and magazines from Vancouver to London, including Newsweek, the Wall Street Journal, and several of the world's leading scientific journals, reported strange tremors in the world of evolutionary biology." "The most interesting part of the article was the way the authors chided biology professors for presenting speculative ideas as facts. 'Many generations have listened passively to these presentations,' they noted. 'We feel obligated, however, to warn our readers that these peaceful days are coming to an end and that we must prepare for strife. '...They urged their readers to 'avoid the usual practice of leading all discussions in such a way as to glorify Darwinian theory. With SOR students lurking in the class, frail scenarios will no longer be passively accepted.'" Catastrophic Plate Tectonics: The Physics behind the Genesis Flood: "The crucial final piece of the puzzle has come from laboratory experiments that have carefully measured the way in which silicate minerals deform under conditions of high temperature and high stress. These experiments reveal silicate material can weaken dramatically, by factors of a billion or more, at mantle temperatures and for stress conditions that can exist in the mantles of planets the size of the Earth.. ." But those who determined over a century ago to use "scientific evolution" as the foundation for today's social evolution prefer to hide these truth. The scientists vs. God: A funny story with an important reminder. 1. Charles Darwin, Origin of Species (Cambridge, MA: Harvard University Press, 1964), pages 128-129. 3. Charles Darwin, Voyage of the Beagle, edited and abridged by Janet Browne and Michael Neve. (London: Penguin books, 1989 ), 269. See also http://www.antlionpit.com/darwin.html. 4. Ibid., page 271, 278-9. 6. Jonathan Weiner, The Beak of the Finch (New York: Vintage Books, 1994); page 21. 8. Encyclopedia Britannica, Volume 7 (1968), page 83. 9.Charles Darwin, Origin of Species, page 180. 10. Jonathan Weiner, The Beak of the Finch (New York: Vintage Books, 1994); page 134. 13. Ibid., pages 123, 125. 14. Random House Unabridged Dictionary, Second Edition (New York: Random House, 1993). 15. Jonathan Weiner, The Beak of the Finch (New York: Vintage Books, 1994); page 205-206. 19. Some intentionally false and misleading illustrations will documented in Part 2. 20. Dr. Carl Wieland, 101 Signs of Design: Timeless Truths from Science (Green Forest, AR: Master Books, 2002); page 87-90.